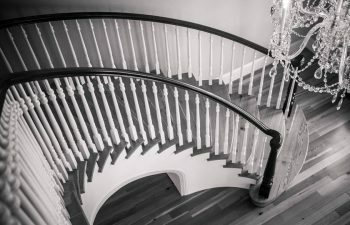 An expertly designed staircase can truly set the scene within a residential or commercial space. In this two-part series, we explore a different type of scene: famous staircases from movie sets. Join us as we take a look at iconic stairs designed for films throughout history. Who can forget the elaborate staircase in the epic movie, “Gone with the Wind”? A true Hollywood classic, these stairs have become an icon, referenced over the years and known for their classic elegance. 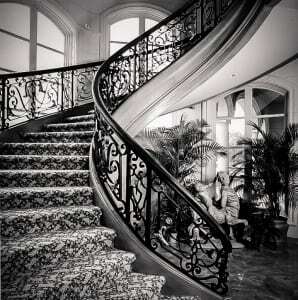 Serving as the background to many of the film’s scenes, the circular stairs exemplify southern charm. In one of the most dramatic scenes in movie history, main characters Scarlett O’Hara and Rhett Butler argue before he sweeps her off her feet, carrying her up the elegant stairs. The stairs in “Home Alone” are a hub of activity throughout the comedic holiday film. When the title character, eight-year-old Kevin McCallister, is inadvertently left behind by his family as they set out for holiday travel, his first reaction is pure excitement. He races up and down the stairs, celebrating his newfound freedom. As a bonus, he even sleds down the staircase, out the front door and into the snow. Later in the movie, when threatened by ‘bad guys’, Kevin uses the staircase for protection, setting up paint cans to soar down from the top of the stairs. His plan is a success, preventing the intruders from reaching him on the second level of the home. The setting of scenes that every kid (and adult) remembers with a smile, this staircase is a great example of classic stair design. It matches the home’s traditional style, featuring an elegant wooden baluster system and lending a simplistic yet high-end look. Our next featured stair design is the beautiful stair in another family favorite, “Father of the Bride.” The iconic curved stairs and wooden baluster system are exquisite. A classic design built to withstand the test of time, the staircase reflects the movie’s theme of family’s unbreakable bonds that will remain strong despite years of growth and change. In the film, as George Banks’ grown daughter prepares to announce her engagement, George flashes back to the memory of her as a child, sliding down the wooden handrail of their curved staircase. In a touching scene later in the movie, viewers see the proud look in George’s eyes as his beautiful daughter stands atop the landing, preparing to descend the curved stairs in her beautiful wedding dress and shoes, designed especially for the big day. Whether in film or reality, stair design plays a large role in the overall theme and tone of a space. It is no surprise that each of these unique staircases sets the stage for unforgettable movie scenes. Stay tuned next week as we continue our feature of iconic Hollywood stair design. Visit our commercial and luxury residential project galleries for additional details and pictures on our exquisite projects. From inspiration to installation, our team is committed to designing and building the highest quality custom staircases. Our reputation speaks for itself and client satisfaction is our highest priority. Contact us today to discuss your next custom stairs design project.